Viability: viable businesses built to thrive. Accessibility: accessible services, capital, networks, and businesses. Local Leadership: led with, marketed to, supplied by, and benefiting the local community. Unity: positive participation in unifying groups/organizations and other ecosystem-building activities. Equity: hiring and paying living wage to all, with a strategy for supporting underrepresented and low-income community. Sustainability: beneficial relationship to the environment. ​Our Bay Area Entrepreneurship Alliance is VALUES-based. The VALUES Wheel illustrates our cohesive set of shared, core beliefs. 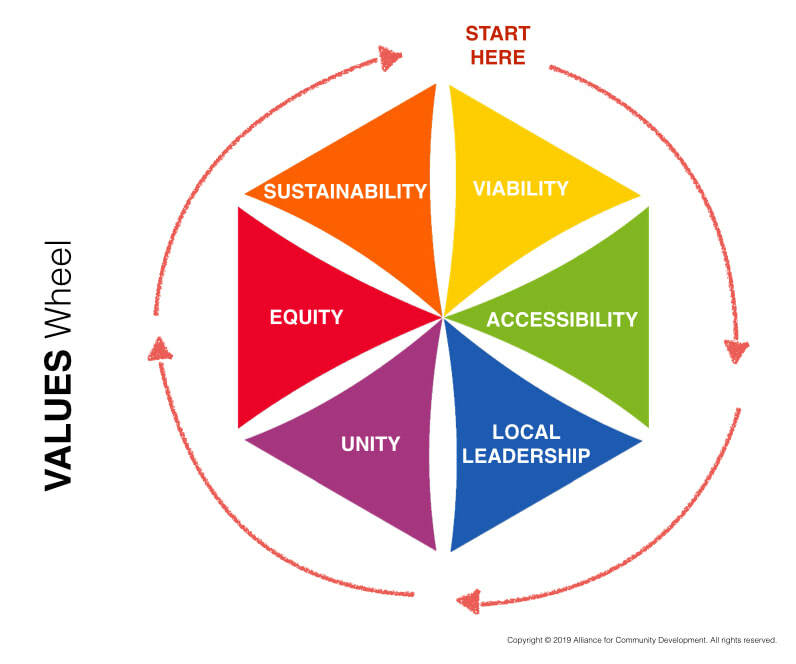 We ask all Bay Area Entrepreneurship Alliance (BAE Alliance) members to commit to these shared VALUES, help hold fellow BAE Alliance members accountable to them, and work to incorporate these VALUES into our larger entrepreneurship ecosystem wherever possible. ​When a local entrepreneur or support provider embodies these VALUES, we call them a "VALUES-based business."